The dive site SS Clan Stuart is an inshore historical wreck in the Simon's Town area on the False Bay coast of the Cape Peninsula, near Cape Town in the Western Cape province of South Africa. 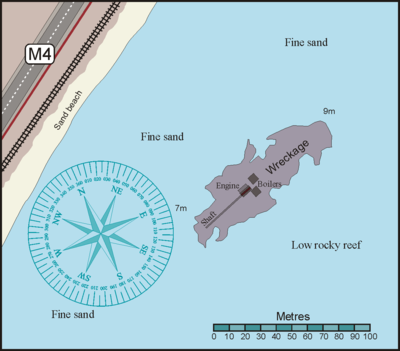 Map of the dive site at the wreck of the SS Clan Stuart. This is an easily accessible shore dive, with adequate parking and well protected from south westerly swell. It is suitable for training and night dives, and has quite a diverse population of reef animals and some interesting wreckage. The “SS Clan Stuart”, a 3500 ton British turret steamer carrying a cargo of coal, ran aground after dragging its anchor in a South East gale on 21 November 1914. Several efforts were made to re-float the ship over a period of 4 months, but without success. The ship’s engine block still breaks the surface. Visibility is not usually particularly good, as the site is close inshore and the surge can be strong, but it is not usually too bad either, and can be judged moderately accurately from the shore. The wreck lies in fairly shallow water (about 8m) The area is mostly fine sand with occasional low sandstone outcrops. The iron structure of the wreck has become very broken up over the years. A section of the triple expansion steam engine framework structure extends above water, with the low pressure cylinder mountings to the south west. The crankshaft, connecting rods and propeller shaft with large cast iron propeller are still in place. There appear to be the remains of a condenser on the port side of the engine. Just forward of the engine are the remains of the two coal-fired scotch boilers. Both have been dislodged from their mountings, and are lying on their sides with the cylindrical furnaces lying one above the other. 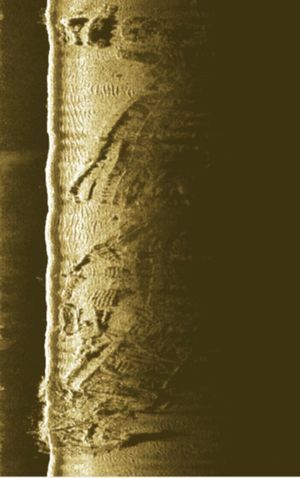 The walls have rusted through in places and the tie-rods are clearly visible The wreck lies at about 45° to the shoreline. The bow at the north east end is about 30m from the engine block and is the deepest part at about 9m. The plating has largely rusted away, but a fair amount of framing is still recognisable. The stern at the south west end is about 15m from the engine block and is both the shallowest part and closest to the beach. Most of the wreckage is very low, but there are a few places where it is possible to get into covered areas. A long angled section of plating on the port side forms a small low tunnel many metres long, probably too small to get through in places, but you can see light from one end to other, and both ends are open. Geology: Sand bottom with occasional outcrops of sandstone reef, probably of the Ordovician Peninsula formation, but possibly of the underlying Graafwater formation. Strike is close to east-west. and dip about 10° to the south. The site is exposed to south easterly wind and waves, which will make the entry and exit tricky or hazardous. Dive during or after westerly winds. Generally a winter dive, but sometimes also dived in summer if the south easter has not been blowing too hard and the shore break is not too rough. There is usually some surge at this site, and the strength can be judged to some degree by watching the swells at the engine block. Swell period is important as well as height, as long period swells (10 seconds or more) have more power and cause a more disruptive surge. Suitable for night dives. Adequate off road parking on the far side of the road. Part of the steam engine of the wreck of the Clan Stuart projects above the surface at most states of the tide. This view is from the road and shows the beach entry. The site is usually dived from a shore entry. There is adequate parking off the main road in front of the site of the old Marine Oil Refinery (demolished 2005), north of the Dido Valley road and opposite the beach at Mackerel Bay. Entry is from the beach. The entry and exit is easy if the swell is low, though there may be a small surf break. 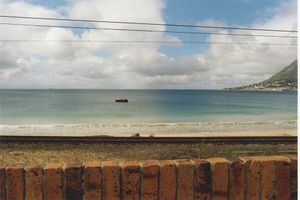 It is necessary to cross a low brick wall and the railway line to get to the beach. Moderate variety of invertebrates and fish. The growth inside includes more corals and bryozoans than the outside, which is predominantly covered by Red bait and coralline algae, right down to the sand. Pyjama catshark, puffadder shysharks and occasional cuttlefish may be seen. Iron wreck of considerable archaeological interest, as very few ships of this type were built. The wreckage is protected by legislation and may not be disturbed. Swim straight out to the engine structure on the surface, Dive and explore the engine and boilers, then follow the shaft to the remains of the propeller. Continue around wreck, then swim back to shore on compass bearing 330° magnetic. Some ragged edged iron plates. 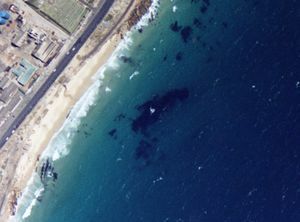 A very large Great white shark was seen at this site by Scuba divers in 2010 and again in early September 2011. A reasonable level of fitness is desirable to carry the kit from the parking area to the water's edge, over the wall, the railway line, embankment and sandy beach. A light is useful for looking into dark holes and recesses. This page was last edited on 8 March 2012, at 10:40.